Methods of processing jeans has changed over time. Environmental considerations and the health effects on workers have been taken into account. For example, sandblasting caused serious health problems for garment workers and has been widely banned and alternative methods to achieve the same look have been put into practice. 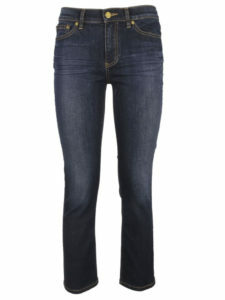 Another example is the development of the enzyme wash process as a more ecological alternative to stone washing jeans. 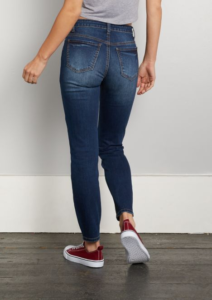 Just as the name implies, raw denim (also called “dry” denim) is left untreated after the dyeing and finishing process.The denim isn’t washed before it’s sewn into garments so the stabilizing agents applied to the cloth remain and because of this and being that the cloth is usually 100% cotton, the denim garments are stiff and rigid upon purchase. The indigo dye used still saturates the fiber and because the fabric isn’t pre-washed the dye is likely to rub-off. Some raw denim is pre-shrunk (sanforized) while some raw denim is left untreated( unsanforized ). 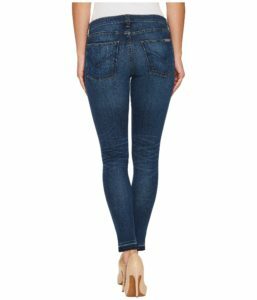 Usanforized raw denim can be expected to shrink 5%-10%. 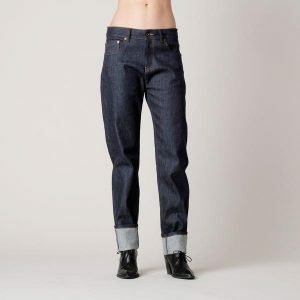 Most purchasers of raw denim are men but there are some women enthusiast for raw denim. 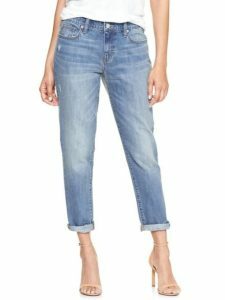 Because of the rigidity of the cloth, jeans made from raw denim may suit women who have a slim rectangle body shape / boyish figure best because there isn’t much “give” to accommodate curves. 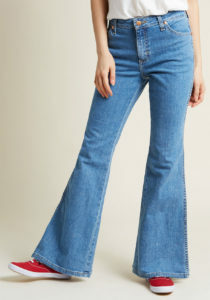 However, curvy girls can wear raw denim but may require restriction to fewer brands that are cut for women’s figures that may have some curve or else purchase bespoke jeans. 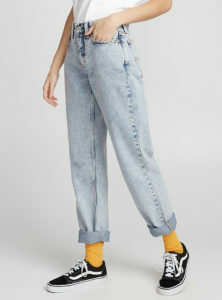 In the pictures below, the boyfriend jeans are 2% spandex and 98% cotton and the skinny jeans are also made with fabric that has some stretch. 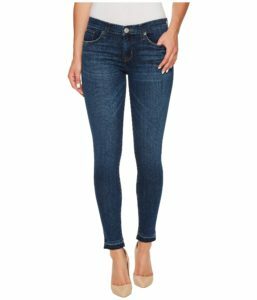 Medium or mid wash and light wash jeans are processed in the same way as rinse wash/dark wash denim. 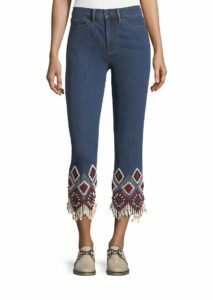 The only difference is that they are washed for a longer period of time to remove more of the indigo dye to achieve the look of faded jeans. The color saturation for what is defined as light wash or mid/medium wash varies by brand. 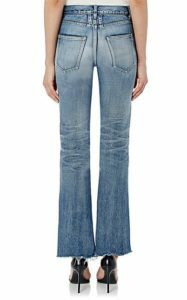 Light-wash denim can make bottom heavy figures like the pear shaped body type and the diamond body shape appear bigger on the bottom. 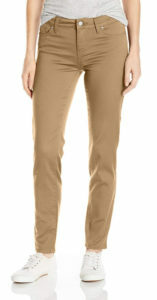 A good choice for these figures is a slimming dark wash or darker medium wash jean. 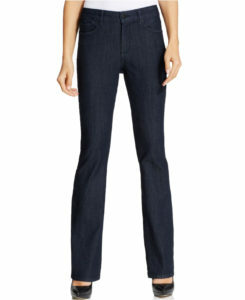 Light-wash jeans paired with a dark top will elongate the torso for a short torso and long legs, vertical body type. 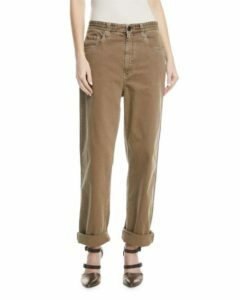 Indigo dyeing is used to produce blue hues of denim while sulfur dyeing produces jeans in colors such as khaki black, green, pink, and mustard. 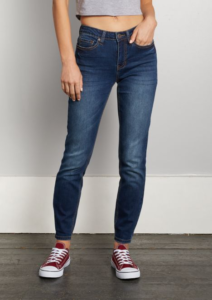 For classic indigo denim in a twill weave, the warp thread is dyed and and the weft thread is white leaving the underside dominated by white threads and the outer surface dominated by blue threads (though in some denim both the warp and weft thread is dyed). 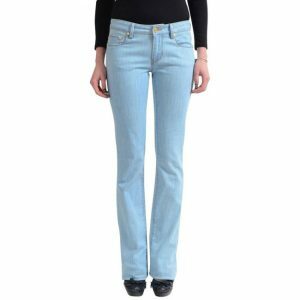 Garment dyed denim has undergone a dyeing process after the garment is sewn. This can lead to characteristic uneven fading which is actually sought by those who are fans of this wash. The over-dye can match the color of the finished garment or the over-dye can be in a different color than the finished garment. Examples of the latter case – a black dye over blue/indigo jeans or a mustard yellow dye over white jeans. 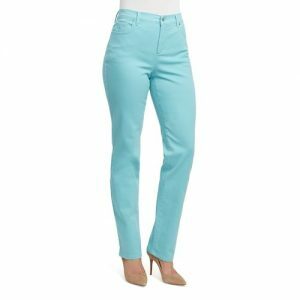 Garment dyed and tint/color jeans are a great way to welcome warm weather in spring or break up the winter doldrums with a bit of color. 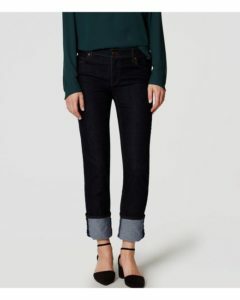 Mixing tint/color jeans or garment dyed jeans with standard indigo/blue denim or a chambray shirt keeps your denim-on-denim outfit from being monochromatic. 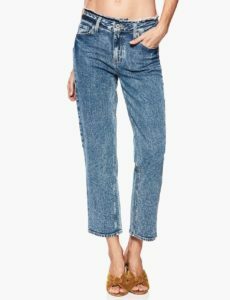 What are distressed jeans? 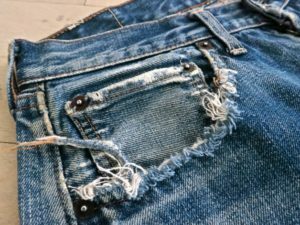 Distressed jeans can be defined as a process or series of processes that are applied to the finished garment to make the jeans look broken in or aged. 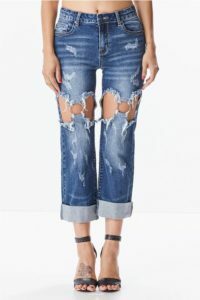 There are varying degrees of distressed denim – from the conservative removal of dye and fiber material which simulates the natural fading on jeans to the destroyed denim look with rips, fraying and abrasion. In this section denim processing techniques are covered. 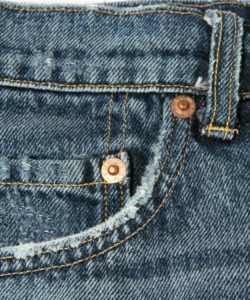 These mechanical processes are additional step that give jeans a much worn or aged look. 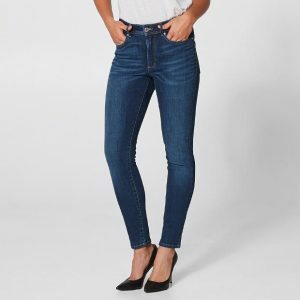 Stone wash (sometimes referred to as stonewash) jeans are laundered with pumice stones to achieve the look of “broken-in” faded jeans that have been frequently washed and worn. When we machine wash jeans, over time this not only removes indigo dye but breaks down some of the fibers. 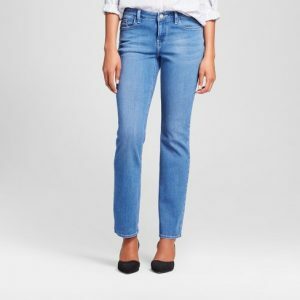 Washing jeans with abrasive pumice stones accelerates this process and softens the denim, simulating the wear and tear that occurs when we machine wash jeans at home. The look achieved with stone washed denim can vary with stone size and washing time. The acid wash process usually involves tumbling the garments with pumice stones or other abrasive agents which have been soaked in a bleaching agent. in the acid wash phase of garment processing, the garments are ”dry washed”, that is the chemical soaked stones and the garments are tumbled in a rotary washer without adding water. 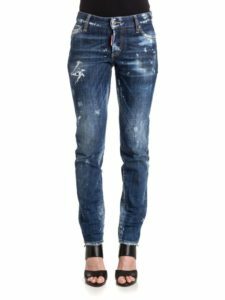 The acid washing process can produce a high contrast faded effect on darker shades or a distinctive mottled look on lighter shades of jeans. 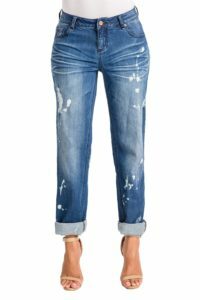 Different looks of acid washed denim can be achieved by varying factors such as stone size and shape, bleaching agent concentration and the use of additional additives. 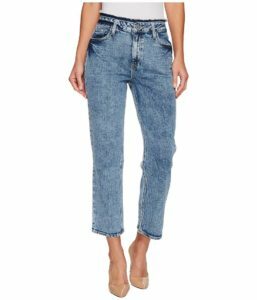 Acid wash jeans (also called moon wash or ice wash) became popular in the 1980’s and regained popularity in the late 2000’s decade. This technique uses enzymes in processing to achieve a worn look and feel to garments. Enzyme washing was developed as an ecological friendly alternative to stone washing. Cellulase enzymes break down the cellulose in cotton fibers on the surface of the garment and also removes some of the indigo dye since the color is on the surface in denim fabric. 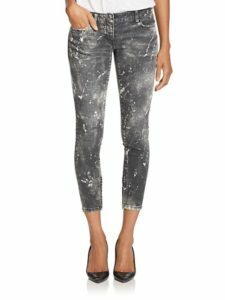 Sandblasting is the technique of lightening specific surface of areas of jeans by spraying sand onto garments at high pressure to get a worn look and fading in specific areas of jeans. Because sandblasting has caused serious health problems for workers in the garment industry, the practice has been widely banned . Alternative methods to achieve the same look are used instead in the majority of cases. 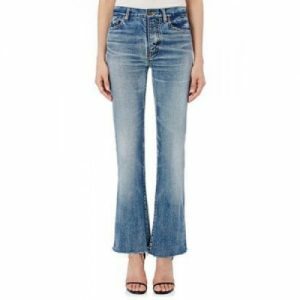 Fading is one of many design elements that can effect how you look in jeans. 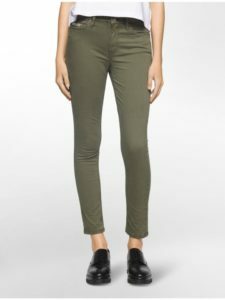 This design element, which has a sort of 3-D effect in adding the illusion of volume is especially helpful for slim body types like some rectangle body shapes and the inverted triangle body shape. 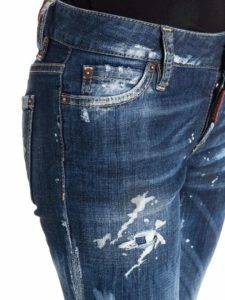 Hand sanding or scraping is a technique used to get a sandblasted look on jeans. 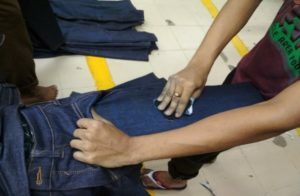 The jeans are placed over inflated rubber balloons and areas such as the thighs or the seat of jeans are sanded by hand. 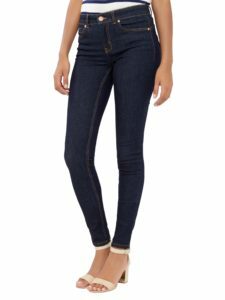 Whiskering is the effect achieved when dye is removed to simulate the creases that occur on the front of jeans at the bend of the hip and leg area from ordinary wear and tear. 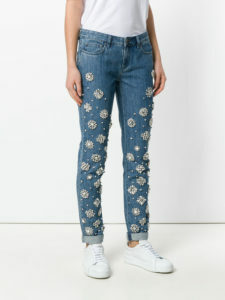 The whiskered jeans look can be achieved using a variety of techniques that usually involve sandpapering the area with or without a mold or whiskering template placed underneath the surface to be whiskered. 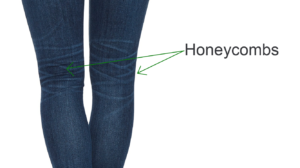 Honeycomb creases are creases in the back of the knee on jeans. 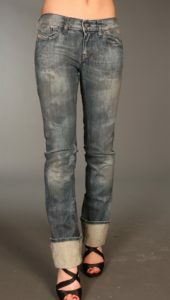 Honeycomb distressing is most often seen in men’s jeans but can be found in some high-end women’s jeans. 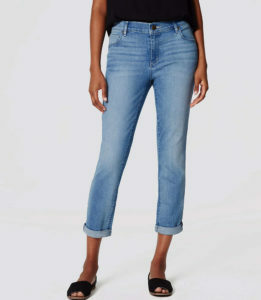 Whiskering on jeans in a lighter wash.
Strategic fading can add volume to a flat bottom or very thin thighs. 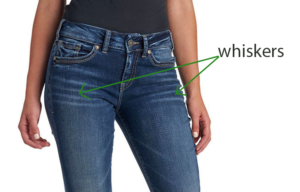 Whiskering at the hip area on jeans can make narrow hips appear wider. 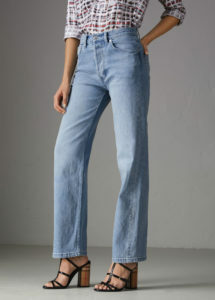 Avoid fading and whiskers on jeans if you have a large bottom and large thighs and you want to slim your figure. 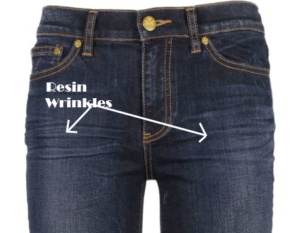 Resin is used to permanently set and emulate the wrinkling that occurs on jeans on the front hip and thigh area and at the back of the knees on jeans. This resin process is most often applied to the front hip and thigh area but is sometimes applied at the back of the knees. 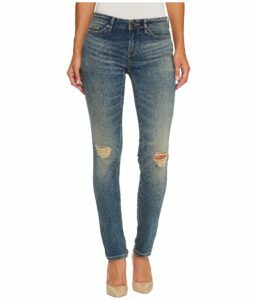 Holes, abrasions, rips and fraying of denim is a more extreme distressed look. Sometimes the warp and weft thread are removed but often the blue of the warp thread and the white of the weft thread is utilized in the distressing. For example, the blue thread is removed in frayed hems, tears or holes and the white weft thread remains. 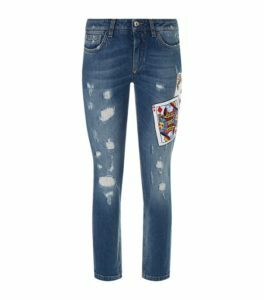 Distressed denim is great for denim-on-denim outfits as a way to not look too matchy. 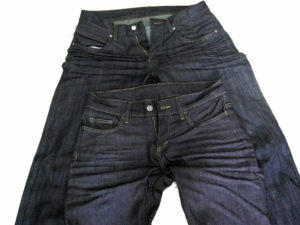 Various machines and techniques are used to abrade prominent, thicker parts of jeans such as hems, pockets and the waistband to emulate the worn edges that “lived-in” jeans have. 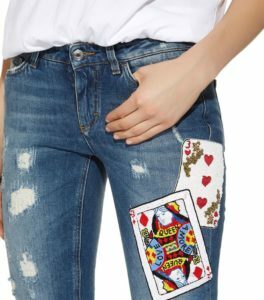 Trends come and go and through the years and adding embellishments to jeans has been a way to do something a bit different with this fashion staple. 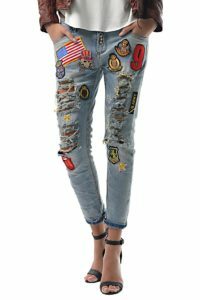 Crystals, sequins, grommets, embroidery, patches, contrasting or decorative stitching and printing on denim have been some of the embellishments used. 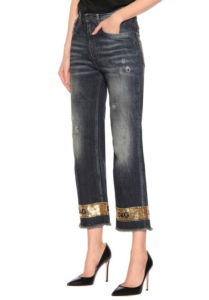 Embellishments are a great way to dress up denim for a fun evening out. 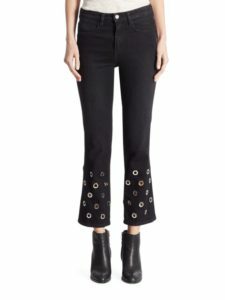 Not merely decorative, embellished back pocket add fullness to flat bottoms.